Send your love in the form of this Exciting Birthday Special Gift Hamper to your dear ones for whom you really care. Inside this beautiful Basket, your recipient will discover an enticing arrangement of favorite Birthday treat like 3 pcs Raffello Chocolates, Bamboo Plant 2 tier, Happy Birthday SMS Chocolate, Happy Birthday Card and Ferrero Rocher-4 pcs. 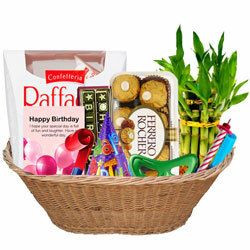 These whole items are carefully packed in a Basket with Birthday Party Accessories.